I was never into muffins. I find them unsuitable for breakfast, too large for a snack and I don’t really eat dessert. Store-bought muffins are too sweet and unpleasantly doughy, and the fresh ones you find at bakeries and cafés are often too sweet for my liking. But like you, I found myself with more pumpkin purée than I knew what to do with after Halloween. After a quick brainstorm, I remembered a pumpkin-date loaf I made a couple of years ago, which had been popular at the office. I also stumbled upon this recipe and it inspired the use of hazelnuts. So one afternoon, I improvised the following recipe for gluten-free pumpkin & hazelnut muffins and I nailed it on the first try (!). 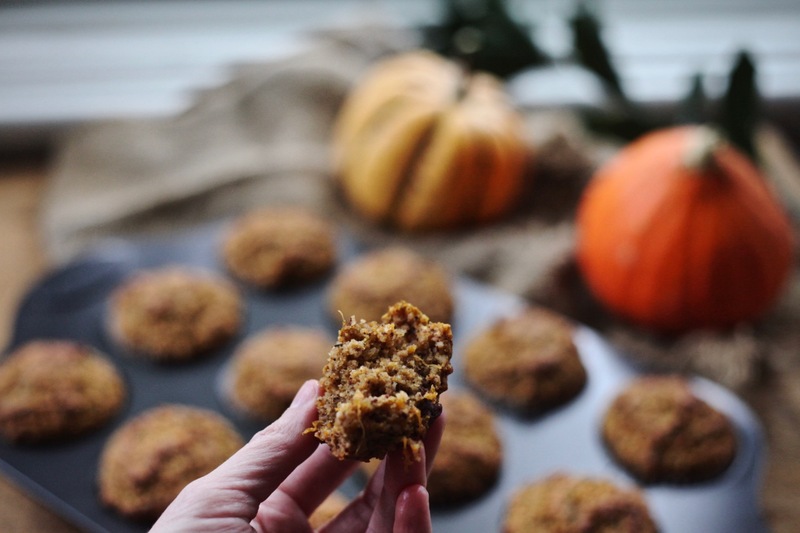 Ten days later, I tested the recipe again for the blog and I confirm it’s a winner. 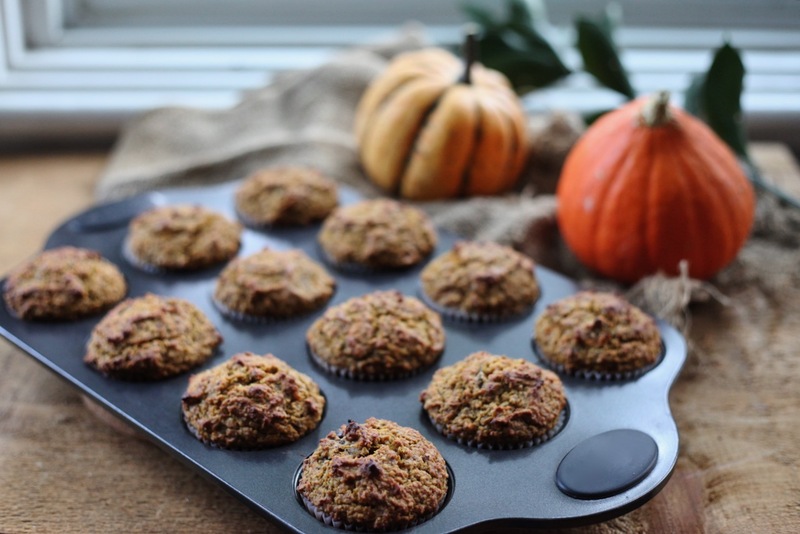 These pumpkin & hazelnut muffins are nutty, moist and just sweet enough. They’re gluten-free and dairy-free, if that’s your thing, but I imagine you could use whole-wheat pastry flour instead of buckwheat, dairy yogurt instead of coconut yogurt and butter instead of coconut oil. They are not vegan, however, as I don’t have much experience in vegan baking (yet). If you are using fresh pumpkin or other winter squash: Cut it in half, remove the seeds and place it cut-side down on a baking sheet lined with parchment paper. Roast it in the preheated 400F oven for 30 to 45 minutes, until the flesh is quite soft and easily mashed. Roasting time varies based on size so be sure to check after 30 minutes. Remove from the oven and let it rest for a few minutes until cool enough to handle. Spoon out the flesh, measuring 2 cups mashed, and saving the rest for another purpose (it freezes well). Note: Some pumpkin and winter squash are very juicy and you will notice that a watery liquid forms as the purée sits. Using a fine mesh sieve, drain the pumpkin purée for 15 minutes to discard the liquid. Set aside. 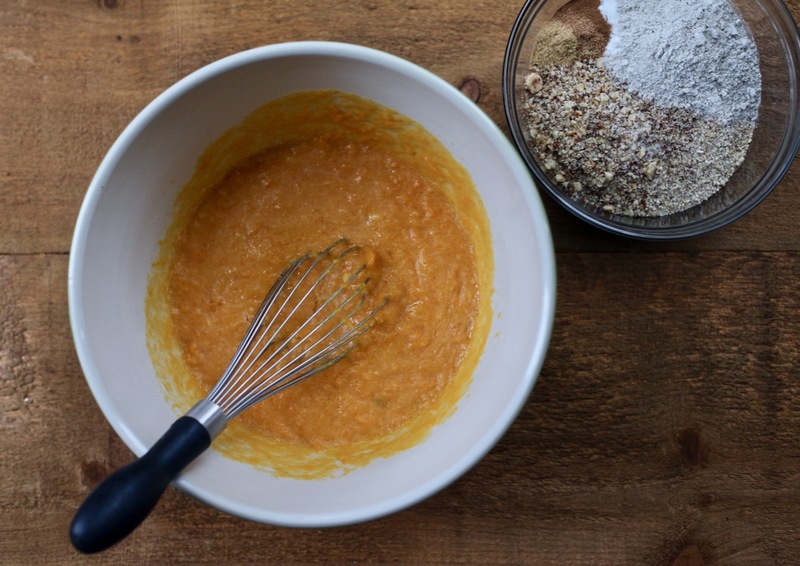 If you are using canned pumpkin purée: Skip the above step. Lower the oven to 350F and toast the hazelnuts on a baking sheet for 10 minutes. 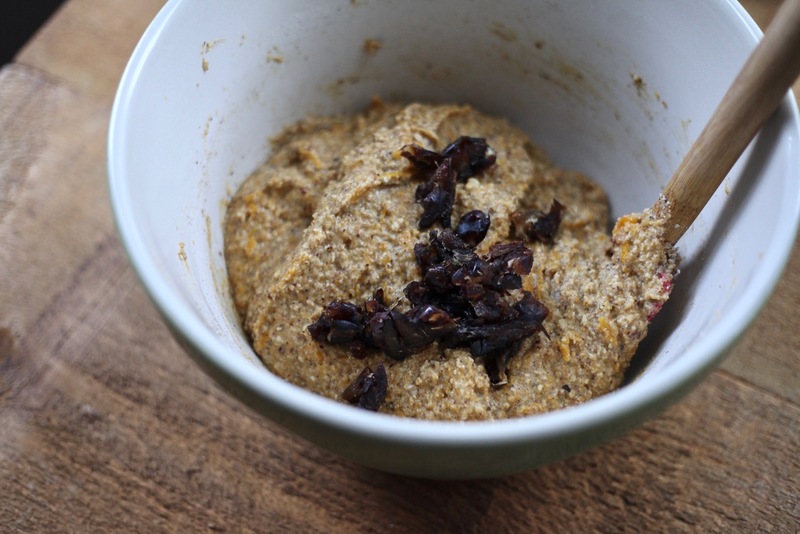 When cool enough to handle, measure 1 cup and place in a food processor along with the oats (no need to peel the hazelnuts). Process until you get a floury texture (see image below). Transfer to a medium-sized mixing bowl. Place the leftover 1/2 cup hazelnuts in the food processor but this time, pulse until they are coarsely chopped. 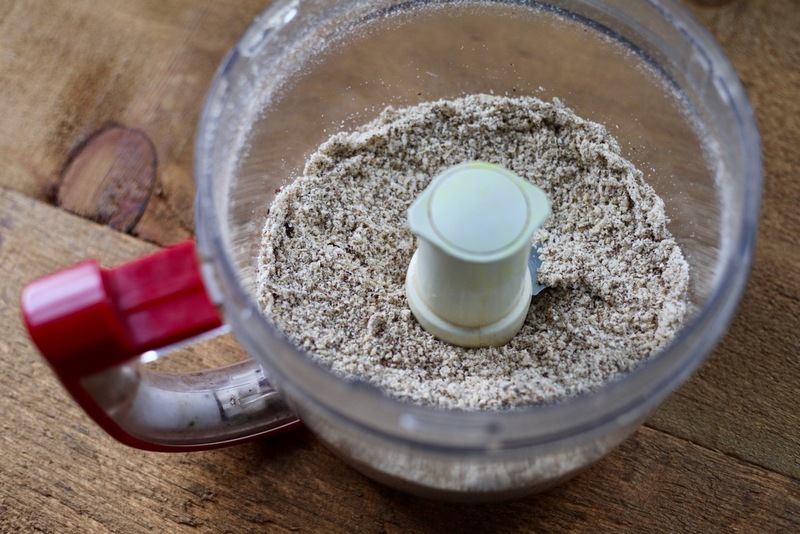 Add them to the hazelnut-oat flour, along with all remaining dry ingredients except the dates (buckwheat flour, baking soda, baking powder, spices, salt) and mix to combine. Set aside. Set oven to 400F. 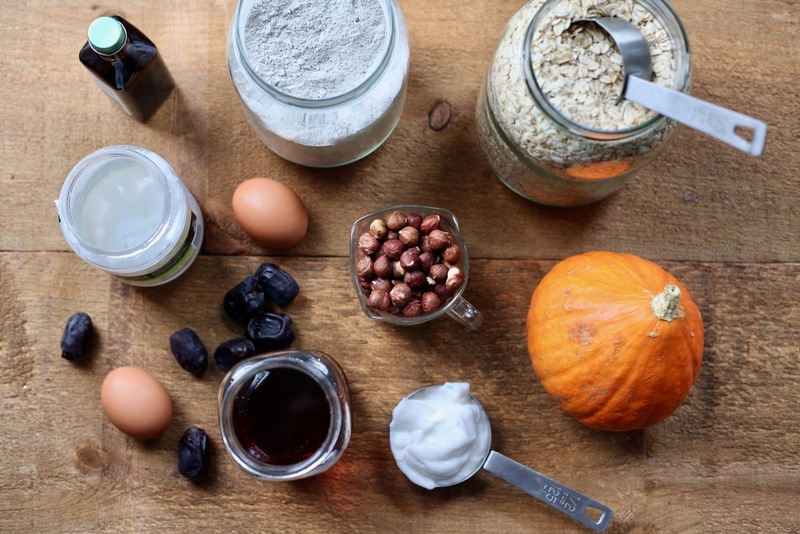 In a large mixing bowl, measure the wet ingredients (drained pumpkin purée, maple syrup, melted coconut oil, eggs, lemon juice and vanilla extract). Whisk well to combine. Add the dry ingredients to the pumpkin mixture and stir until combined. Fold the chopped dates in. 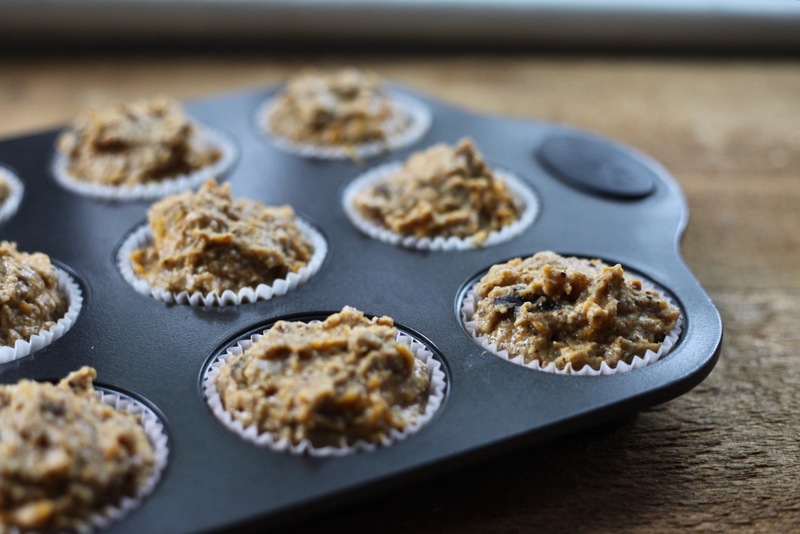 Divide the batter evenly between 12 muffin cups. Bake in the preheated 400F oven for 18 to 20 minutes, or until golden and cooked through. The muffin liners will peel off easier if you let the muffins cool down for 30 minutes to one hour. But who is patient enough for that? YUM.